Whispers around the loop in Cupertino have had Mac mini fans abuzz. After leaving the Mac mini to languish for months, Apple is finally planning a major update to the petite personal computer that is sure to drive new sales. No surprise, then, that the mini will see its first Intel processor, probably the Intel Core Solo, and ditch the PowerPC G4 once and for all. Though some certainly don't want to see it that way. 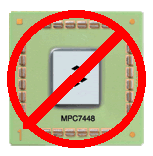 The PowerPC 7448, from Freescale, is the latest in a series of upgrades to the G4. This one uses the e600 core, which is essentially identical to the traditional G4 core but relies on Freescale's new ultra-modern naming conventions meant to make the company look like it's hard at work on new technology instead of just tweaking a design that goes all the way back to 1994. Steve Jobs made the decision to stick with the G4 as long as he did for one reason: Being over a decade-old design, it's really, really cheap and he thought it was a good way to run the contract with Freescale out. It just so happens, however, that we never told Freescale when exactly we were going to stop ordering from them. So look who gets stuck holding the G4! Bwahaha! Apple, Freescale, and IBM were not available for official comment.